Special interest groups have been peddling misinformation in an effort to prevent the Oregon legislature from pulling the plug on a tax break for the rich. That tax break is the newly created federal tax deduction for pass-through income — the profits from S-corporations, partnerships and limited liability companies passed through to their owners. Oregon stands to inherit this tax break, unless the legislature rejects it. The data is quite clear that the federal deduction for pass-through income is by-and-large a giveaway for the well off, and yet special interest groups are pressuring lawmakers to leave the deduction alone. They argue that rejecting it would put “small business” at a disadvantage over big business. President Donald Trump, a self-declared billionaire, describes his company as “much bigger, much more powerful than they ever thought”. The Trump Organization is an agglomeration of more than 500 S-corporations and partnerships that stand to gain from the new federal tax deduction on pass-through income. Certainly, no one can argue with a straight face that the Trump Organization is a small business. Size doesn’t matter. It’s the rich who will get the bulk of the tax benefits. The new federal pass-through tax deduction will cut taxes for well-off business owners. 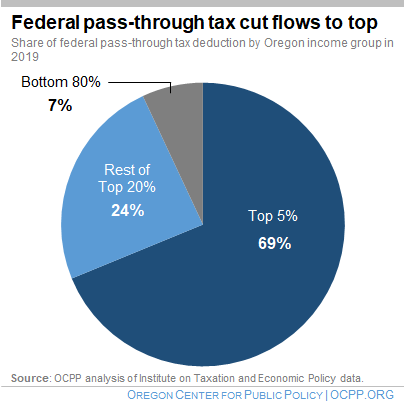 The majority of the tax benefits will go to the highest-earning 5 percent of Oregonians. One of the many blatant pieces of misinformation floating around is that rejecting the tax deduction for pass-through businesses would give C-corporations an advantage over pass-through businesses. It’s just not so. C-corporations — unlike pass-through businesses — are subject to corporate income taxes. While not all C-corporations are big, any company listed in a stock exchange is a C-corporation. So household names such as Walmart, Bank of America, and Nike are C-corporations. In Oregon, C-corporations are subject to a corporate income tax rate on their profits ranging from 6.6 to 7.6 percent, or a corporate minimum tax. After the corporate income tax is assessed, C-corporations can chose to distribute profits to their owners (shareholders) in the form of dividends, which in Oregon are taxed like any other type of income. By contrast, pass-through entities in Oregon do not pay a corporate income tax rate on profits. The profits of the pass-through flow to the owner, who pays personal income taxes on that money — the same tax that applies to dividends from C-corporation shareholders and paychecks for working families. However, Oregon already gives some owners of pass-through entities a lower tax rate on those profits than they would otherwise pay under the regular personal income tax system, meaning that these business owners often pay a lower tax rate than their employees do. Two conclusions flow from this. First, comparing the personal income tax rates owners of pass-through businesses pay on their individual profits to the tax rates paid by C-corporations is an apples-to-oranges comparison. Second, once you factor in the tax rates that owners of “big” C-corporations pay on dividends (the profits they received from the company), owners of “small” pass-through entities have the advantage. That’s not to suggest that C-corporations are paying their fair share in taxes. They are not. And neither are many owners of pass-through entities. True mom-and-pop businesses would get very little out of the new tax deduction for pass-through income. Only 7 percent of the tax benefits flow to folks in the bottom 80 percent of income. Yet these folks, along with all Oregonians, stand to lose if Oregon goes along with the federal tax scheme. If Oregon replicates the new federal tax deduction for pass-through income, it will cost the state hundreds of millions of dollars each of the next few budget periods — money that could go to hiring more teachers, making housing more affordable, or addressing other pressing needs. Mom and pop will be better off if kids get a good education than if a rich business owner gets yet another tax break. The “small business” argument is a smokescreen. The Oregon legislature needs to be clear-eyed on this. It needs to act in the best interest of Oregonians and prevent Oregon from doubling down on the misguided federal tax break on pass-through business profits.